Having never made a bio-pic about a saint, I can only guess at the moral complexities waging war within the soul as pen is put to paper and story put to board. As far as I can tell, in post-modernity we’ve only really had three people who’ve reached the pop zenith of universally being claimed a ‘glorified soul’, those three being Gandhi, Mother Teresa and Nelson Mandela – artists (yes Bono – that term has been extended to you), presidents, prime ministers, general secretaries (and that includes to date, Aung San Suu Kyi) sportsmen, and (shudder) actors need not apply. I can’t think of another character/human in recent times that has been elevated to the status of those three individuals, and that encompasses their idealised role as example via mythology that can only, for the most part, propel humanity toward enlightenment. On behalf of the legend of these three people, I make the rather bold statement that a special kind of film should be reserved for them and their memory, the equally stainless example of which is Richard Attenborough’s 1982 film Gandhi, which turns out to be the perfect propaganda film on behalf of an albeit fabled history, but a fable that, I will contend, serves more in its myth than the truth of the circumstances do in their accuracy. If the definition of propaganda is that it begins where critical thinking ends, then surly there is a place for heroic myth that serves only to inspire, given weight by the inargueable enormity of accomplishment that is generally acknowledged to have moved humanity toward a Kantian enlightenment (to reuse and clarify what I mean) that transcends the petty detail of the no doubt very real and raw aspects of the characters humanity. We don’t care that Nelson Mandela cheated on his wife when he was young – that information has no value when compared to what he accomplished in his life, and the manner in which he accomplished it. If you need him to be demystified, then do it in your own time in the privacy of your own home. This battle between accurate representation and sustaining the myth, as it turns out when we look at films made about these individuals, is a difficult one, and partly why I suggest there is no point in trying to do anything other than making an excellent, highly watchable, inspiring propaganda film. Only the reactionary want to see any of these three individuals exposed for their faults on a big screen in front of millions of people and only the staunchest proponent of auteur theory thinks the film should be more about the film maker than its subject. The truly interesting questions about these kinds of folk lie in our response to them anyway, not in their individual lives, so if you are going to do a bio-pic, accept that a certain decision about the kind of film you are making has already been made. 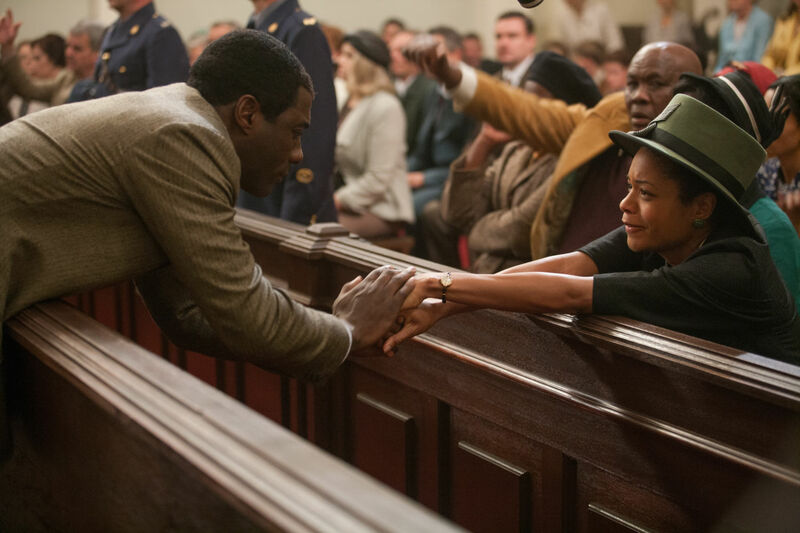 Elba and Harris as Nelson and Winnie reach for each other at Mandelas trial where he is sentanced to life in prison. The result of this nobility is, of course, a virtual home movie that only appeals to the immediate stakeholders – who of us wants to see a version of Nelson Mandela’s life that has been signed off on by all the living parties that have their own version of who he really was and is? That is as a false as the myth those of us who have never met him have built for our convenience. There are very few people alive who can’t tell the difference between the myth and the man, and in fact Nelson Mandela’s existence dictated his mortality. It is only after he has died that he is able to become immortal and it is his immortality that belongs to the ages, the audience and the script writer. To portray him as an ordinary man, if you have read the book upon which the film is based, means sublimation and virtually hiding many of the phenomenal things about Nelson Mandela that – well, elevate him above the common man. Of most poignant regret is the jail scenes, which in the auto-biography reveal a man determined to create a potent spiritual presence the results of which will be realised in the jailers calling him ‘Sir’, and yet need to be hidden by someone determined to represent everyone ‘accurately’, so that the film implies Mandela’s tomato gardening becomes the source of a wisdom that transcends (there’s that word again) time and place; a transcendence, incidentally, not passed on to his fellow tomato farmers. 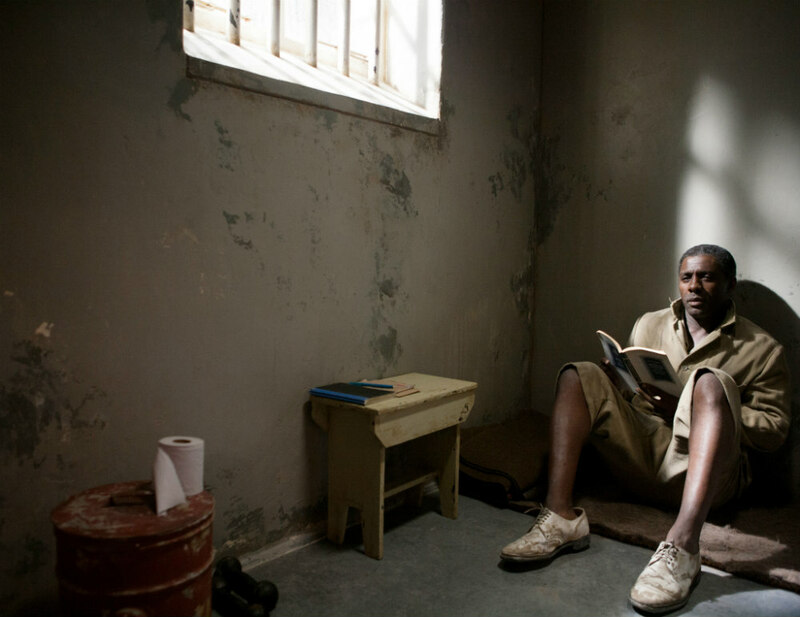 Idris Elba as Nelson Mandela in prison. The final result is their weird white-washed narrative that takes so much effort in pandering that it completely neglects the point of the film, which is not the man’s ordinariness, but his greatness, not the stuff that makes him the same as us, but the stuff that makes him different, not the ways he gave in to life’s petty (and enormous) problems, but the way he rose above them. Idris Elba isn’t nearly as good as everyone says (and I like him a lot usually) because he suffers from the duel humilities of equally trying to down play his subject, and some truly terrible makeup problems; at least he’s not as good as Naomie Harris who manages to make us fall in love with the unlikeable Winnie Mandela, and who does manage to bring a little grandstanding to a role that is absoltely not now, not ever about an ordinary person. Justin Chadwick doesn’t make the same sorts of terrible mistakes when pandering that Steve McQueen makes in 12 Years a Slave, but he does “politically correct” the life out of a film that we will now have to wait at least a decade before it can politely be remade. And I greatly fear, Richard Attenborough won’t be around to do it. 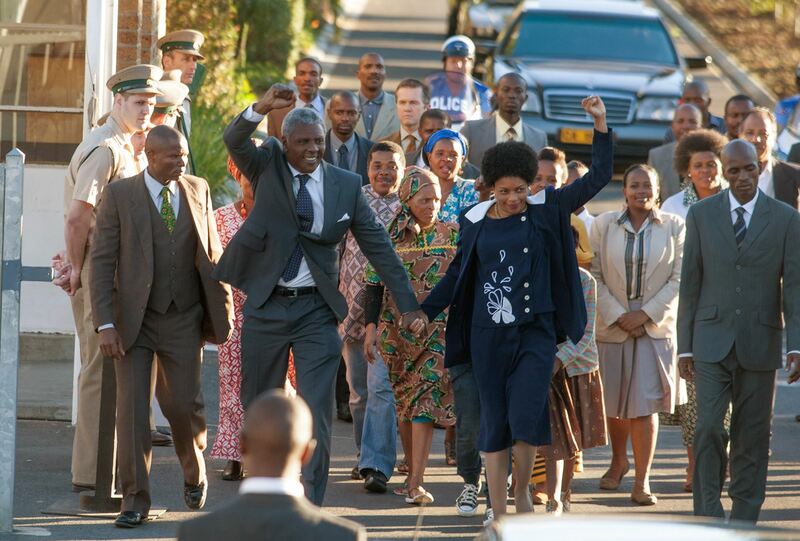 Mandela walks free from prison hand in hand with Winnie. 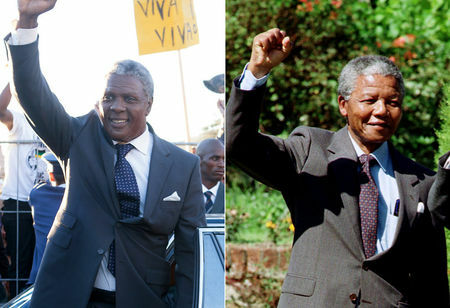 Image comparison between Elba and Mandela. That was clear, well ordered, and intelligently intended. A good example of what a writer should do in order to analize something: think about one element of this object, start with that and mantain that subject the entire text, generating structure and order. Excelent!